This shot was taken during the same time period as my previous post. The female is actively working on the nest. The male is also bringing material but I'm sure that she has the final say in arrangement and determining when it's finished. 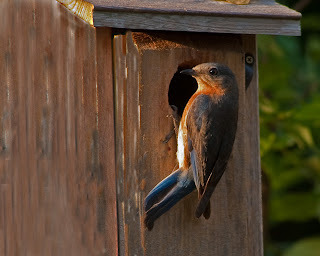 I find these cedar nest boxes that are sold at one of the big box building supply stores for around $11.00 work great. I mount them to a length of aluminum conduit with a length of re-bar inside it. I usually use a 10 foot length and drive about 4 feet into the ground. They last for years and hold up well during hurricanes. I wipe a few inches of vaseline on the conduit to prevent ants from accessing the nest. I don't use snake guards because, even though I have some around here, I've never had a problem with them. Maybe snakes don't or can't climb the aluminum tube. I also leave about 30 feet of open area in front of the box because that's the way the birds want it. 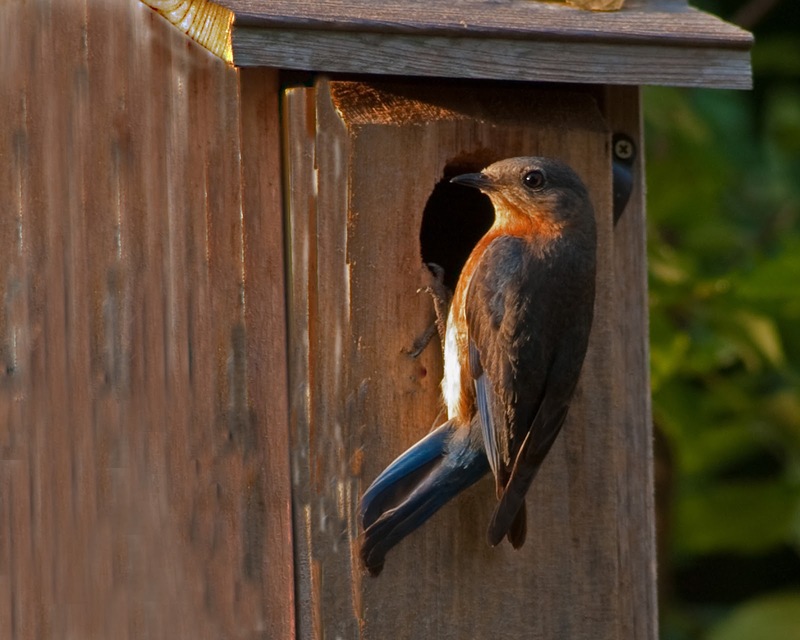 Finally, if you keep your property mowed during the summer months it greatly improves these birds ability to hunt. They do come to my birdbaths although not as frequently as many of the other species around here. If you provide the food, water and shelter the bluebirds will almost always find you.